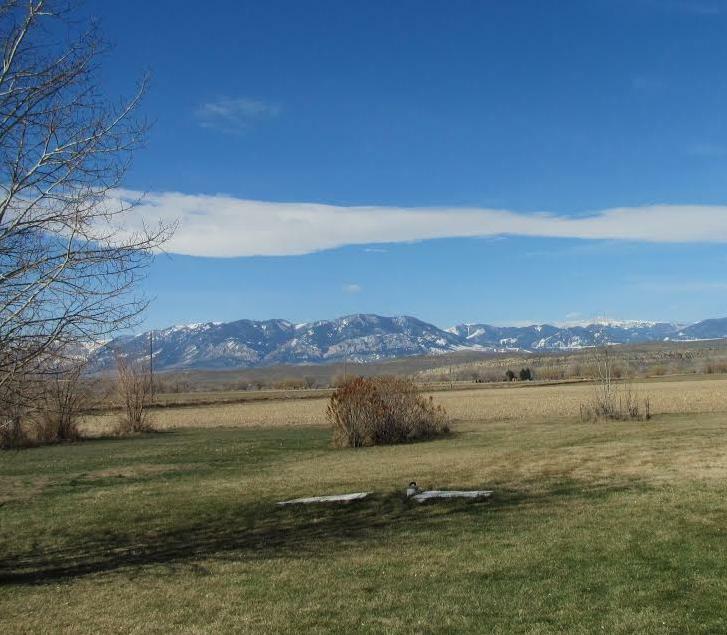 Last week I took advantage of the beautiful Montana spring weather to drive over to Belfry. 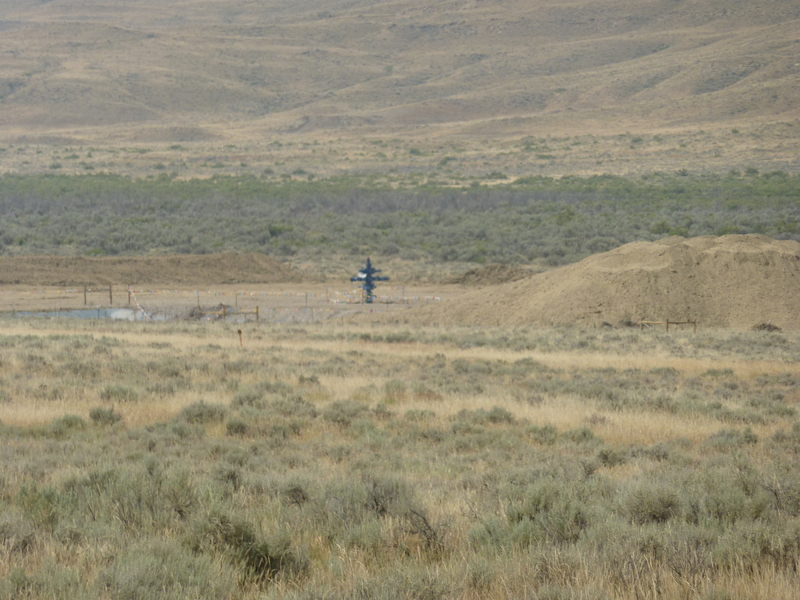 There I could see for myself the site of the well recently permitted by the Montana Board of Oil and Gas Conservation (BOGC). It was one of those incredible Montana days when Winter and Spring intersect. The temperature was near 70, yet the snow was piled high in Red Lodge, where it was the end of ski season. As I dropped down 2000 feet into Bridger the snow disappeared and it was spring. The Beartooths from Belfry. Ski runs visible on the right. Click to enlarge. In Belfry the Beartooth Mountains dominate the landscape, standing watch from nearly 13,000 feet. In one direction I could see the ski runs above Red Lodge, and in another the breathtaking Beartooth Pass that leads to Cooke City and Yellowstone Park. On the clearest days the Grand Tetons lend their wispy beauty from 200 miles away. It’s hard to imagine that this gorgeous scene could be the latest front in the war that pits the oil and gas industry against rural America. But it’s true: this is Ground Zero for the entry of fracking into southern Montana. When John Mork, CEO of ECA, announced last October that his company plans to frack 50 wells in Carbon and Stillwater Counties and “bring the Bakken to the Beartooths,” it sent chills through the region. Residents here know that the cost of the oil and gas boom in the Bakken is being paid by the locals in unrecoverable environmental and social damage. When the first fracking permit application was located right here off Silvertip Road, the battle began. The BOGC fast-tracked the permit, denying local residents and environmental organizations an opportunity for a hearing to present issues and concerns. Northern Plains Resource Council and Carbon County Resource Council quickly sued, demanding a hearing and reform of a process that is completely weighted in favor of the oil and gas industry at the expense of Montana citizens. Because of the suit, BOGC granted a hearing, but it was all for show. The Board ignored requests from residents to modify the permit to provide property protection, and they paid no attention to expert testimony that there are very real dangers to the drilling plan: the permit does not mention hydraulic fracturing, yet it is clearly planned; there is no specification of the chemicals to be used in fracking; there is no source water specified for the millions of gallons that will be required; there are no specified disposal plans for waste water and flowback; and more. Clarifying these things would not be onerous for ECA, yet BOGC appears willing to let the company do whatever it pleases regarding chemicals, water, and waste disposal. In the testimony the expert revealed that BOGC’s permitting standards are even lower than those recommended by the oil and gas industry. The permit was approved by a 6-1 vote. The suit continues as Northern Plains and CCRC seek reformation of a state agency that is broken. It is simply an arm of the oil and gas industry, not a representative of the people of the state. ECA undoubtedly picked this well site because of geological considerations, but they probably didn’t know who they were dealing with. They may regret not finding out. As beautiful as the landscape is, it is clear that people who settle here do not come to get rich. They live here because of the solitude and the beauty, to enjoy nature and to do battle with it for their existence. The growing season is short — four to five months. The risk of extreme weather in planting and harvesting threatens output every year. Water is precious here. People dig their own wells, which go to very different depths: some eight feet, some 15 feet, some 60 feet. There is no map of the underground aquifers, so water quality is always a concern, vulnerable in unknown ways to environmental changes. There is a concern about the current water quality in Silvertip Creek, which runs through the area, but no money is available to test it. Neighbors share a common ditch for a variety of water uses, with a governing board of property owners to manage its use. While neighbors tend to their own business, living in this rugged area creates a common bond among them. When someone is in trouble, neighbors are always right there to provide help and support. The beginning of fracking in the area is certainly trouble, and neighbors are in action, ready to work together to protect their futures. Oil and gas production isn’t a new issue here. The farmers and ranchers in this area have been coexisting with oil wells for decades. It is an uneasy balance, but the residents live with it. The introduction of fracking will dramatically change that balance. Instead of taking place away from their farms and ranches, fracking will bring drilling down the hill and onto their properties. This change threatens their water, their property values, and their personal health. They get that a single spill could wipe out everything they’ve worked to build and hold on to over the years. An oil truck enveloped in dust. Click to enlarge. 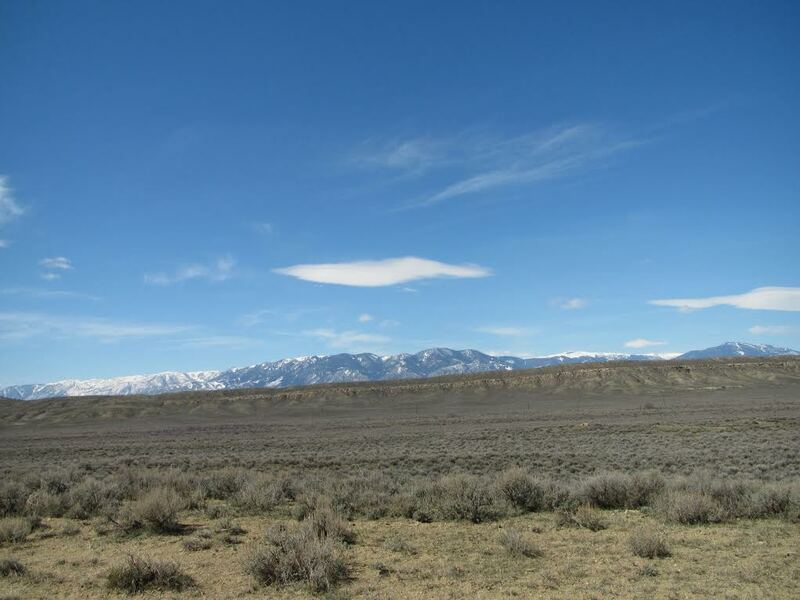 Heading up the two-lane dirt road to the area where oil drilling takes place, my guides and I take a few moments to enjoy the peaceful silence, punctuated only by the song of the Western Meadowlark, Montana’s state bird and the soundtrack of much of the American West. The geology is amazing, the rock cut in jagged patterns as we rise in elevation. From time to time a large oil truck passes by, breaking the silence and enveloping us in a cloud of dust that reduces visibility to zero. Approaching the oil wells a couple of miles up the road, we smell the foul rotten egg stench of hydrogen sulfide, a byproduct of the drilling process. The smell is a stark contrast to the pure air down below, and a reminder of what it would be like if the wells moved down the hill. As we drive up Silvertip Road, the road extends through the oil country into Wyoming, where it goes all the way into Powell. The wells are sparse, one every couple of hundred yards, and they clang away to their own beat, dipping and rising as they pull oil from the earth far below. Rusty tanks hold the product of their work. The pipeline that moves the oil is visible, and its condition isn’t encouraging. We note that this is the beginning of the Silvertip pipeline that flows under the Yellowstone River, the one that broke and caused a major spill in 2011. 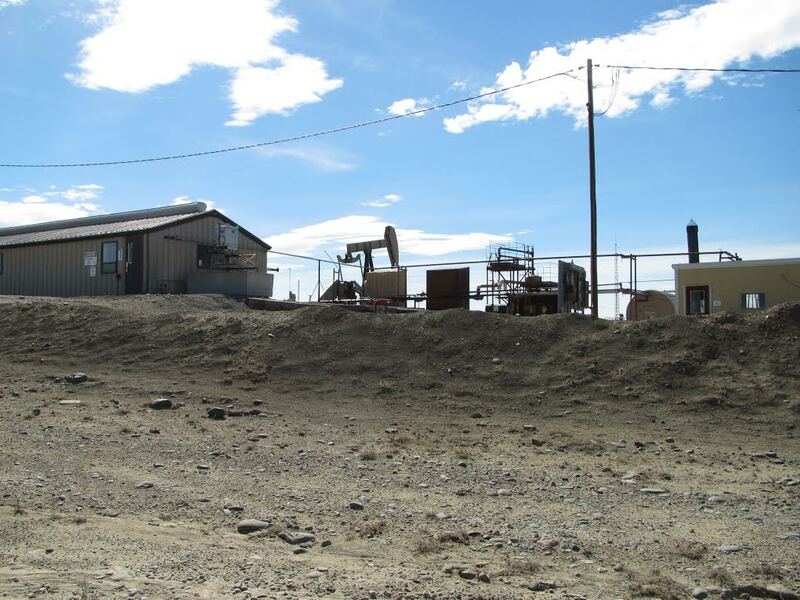 Carbon County is not a huge oil producing area, and this is one of a handful of small pockets of production. County-wide oil output has been declining slowly since 2000, from a high of 56,189 barrels per month in July 2000 to its current level of 31,788 barrels in August 2013. Nobody lives up here where the oil wells are, so the daily balance between the farms and ranches down below is only broken by the trucks, which leave a trail of dust behind on houses, vehicles and crops as they rumble by. There have been a handful of oil spills here dating back to the 1970s, most recently in the 1990s, and the residue of damage from them remains. Since the populated area is downhill from the wells, the risk of spills is always in the minds of residents. Carbon County has been unwilling to provide much help to curb the dust. When a call from a resident to Senator Tester’s office generated an immediate response from ExxonMobil, the road was oiled right away. Unfortunately the county grader came through shortly after and scraped off the oil coating. Such is life in remote oil fields. The residents know that they are on their own in protecting themselves against the heavy industry fracking would bring. ECA permitted well site. The well pad will go near the center of the picture, to the left of the house. Click to enlarge. When I got to the site of the permitted well. I imagined a big blinking neon sign that would say “FRACKING SITE,” but it is just a dry grassy field near a house. I was struck by the fact that the site is clearly a drainage area, very vulnerable to high water that could be dangerous to a water impoundment. I’m told that just a few weeks ago, when there was rapid snow melt that rushed water right through here, the water level was high and would likely have washed over an impoundment at that location. 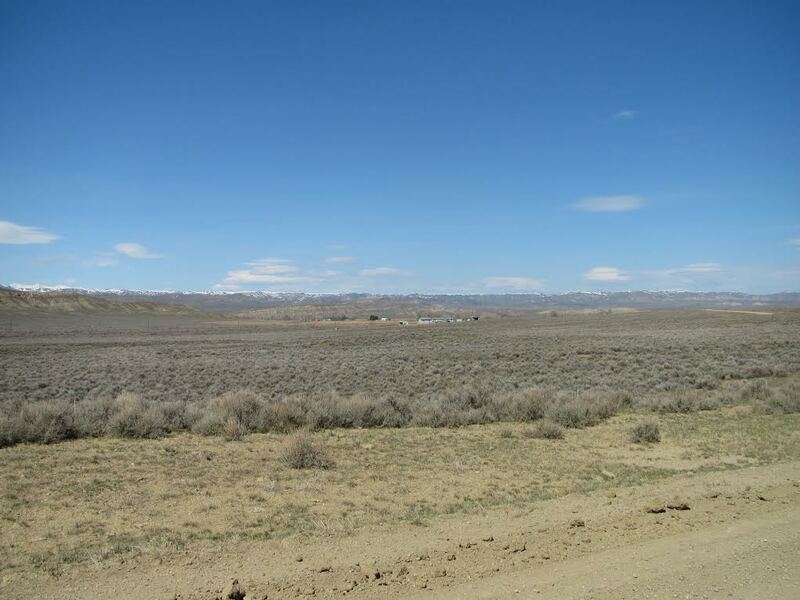 I hear that the owners of this property, who do not own the mineral rights to the land, received a one-time payment of a few thousand dollars for access. They were persuaded that they really have no choice, which is true in split estates, and so they signed. Most of the estates in this area have been separated over the years. Many of the surface rights owners own none, some 25%, some 50% of the mineral rights. Now that warm weather is here drilling will likely begin soon. ECA is advertising for a production foreman for the area. Residents recognize that their tenuous balance with nature and oil and gas drilling depends on how broadly fracking is allowed to take place. And they don’t shy from a fight. It’s important to understand that the people who live here are not the kind of folks who will march into a meeting holding up signs that say, “Don’t Frack My Back Yard.” They have lived with oil and gas drilling for years. They don’t expect to stop it. They know that Montana law favors mineral extraction over surface ownership. Many of them attended the meeting of the BOGC when the hearing over the permit took place. The dismissive body language of the Board members told residents all they needed to know about the contempt the Board had for their concerns. But they also know the tenuous hold they have on their land hangs in the balance. And they’re well aware that few are fighting for them. Despite the lawsuit, they see every elected politician in Congress, in the state legislature and even the Carbon County Commission embracing the oil and gas boom as an economic growth engine. They know that they are just collateral damage. They’re also well aware that ECA is not going to be their friend or partner in this process. The company has stood up in meetings in Red Lodge and talked about corporate responsibility, but people in the area have seen ECA’s safety record in Pennsylvania and West Virginia — 66 inspections with violations, 90 separate violations, and 55 enforcement actions with fines totaling over $80,000 in Pennsylvania; 70 more violations in West Virginia. This is just another corporation wanting to exploit oil and gas. Spills, accidents and violations are just a part of doing business. They know that nobody is going to fight for them, but they know they have to stand up for their rural way of life if it is going to survive. They’re clear on what will happen if BOGC grants every permit ECA requests with no concern over how it affects the area. It’s the same thing that has happened all over the country when the rights of citizens have been sacrificed for oil and gas drilling: their water will become contaminated and their air will be fouled. The music of the meadowlark will be drowned out 24 hours a day. Their crops will suffer and the wildlife will disappear. The destruction of the land will significantly reduce their property values. 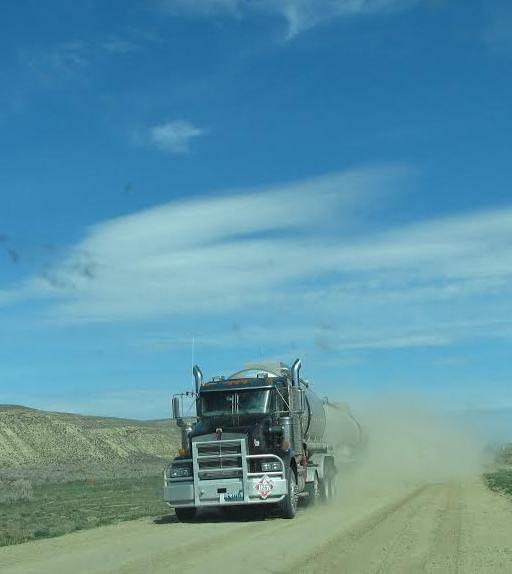 The truck traffic will congest the dirt road, leaving dust everywhere. They will need to lock their doors at night. Whatever royalties they receive for their mineral rights will eventually be gone, and their lives will never recover. They also know that they have rights. Section 3 of the Montana Declaration of Rights, which is part of the state constitution adopted in 1972, says “the right to a clean and healthful environment” is an “inalienable” right. And they know what they need to hold onto their precarious balance with nature and oil and gas drilling. It’s not a long list, and it doesn’t keep mineral rights holders from getting what they want. It just makes them extract the oil in a way that preserves everyone’s rights and property. They’ve discussed it as a community, and they’re clear on what they need to protect themselves: limiting the number of well heads operating at any given time, protecting their water through constant testing and remediation, and designing and operating wells so the probability of spills and contamination is minimized. If you think about it, these are the things the BOGC should have built into the ECA drilling permit if they were doing their jobs. It is respectful of mineral rights and surface rights, and it guarantees the citizens’ right to a clean and healthful environment. The culture of Montana government is still rooted in the early 20th century, when mineral extraction was the only driver of the state’s economy. In the 21st century, when fracking technology endangers people’s lives, their livelihoods, and their health, it’s time for change. Update, April 20: I cross posted this on dailykos and was voted onto the recommended list. That will give this post wide readership. Update, May 21: ECA started drilling on the well this week. 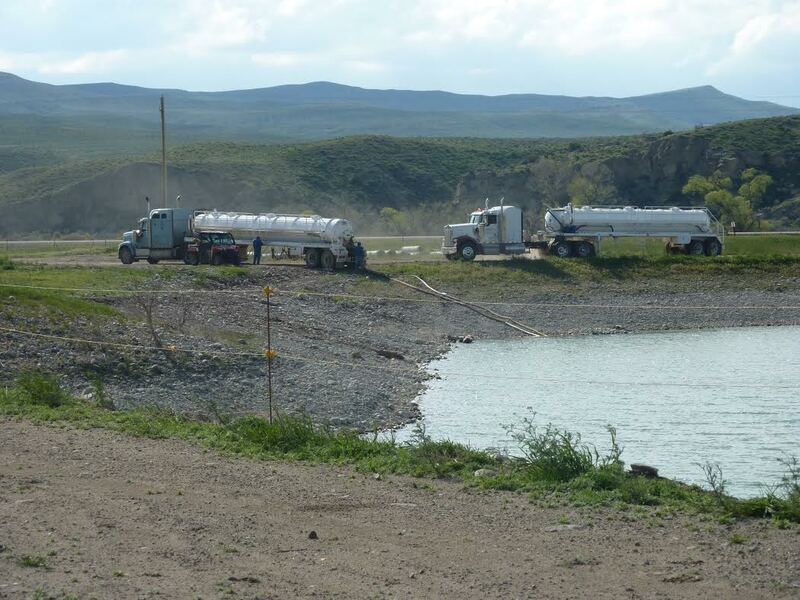 Observant local residents noticed that an ECA contractor was illegally taking water from a local gravel pit without a water right and notified the Montana Department of Natural Resource Conservation (DNRC), which is responsible for issuing water rights in the state. A flood of citizens contacted the DNRC demanding that they step in to stop this. A day later the DNRC shut them down and they were forced to purchase water from another source. Update, June 16: Energy Corporation of America (ECA) took down the well structure at the site. They began dismantling the structure last week and hauled off the structure over the next few days. This is typical in drilling operations. The purpose is to analyze samples they have collected from their initial drilling. Both of these are steps toward hydraulic fracturing. What they are doing is continued testing as they move toward fracking. This means that they have not yet made the decision to frack, but are taking steps in that direction. According to Jim Halverson of the Montana Board of Oil and Gas (BOGC), ECA has told him that they plan on monitoring the results of the perforations for 30 days, then will apply to frack if they want to move forward. Update, August 14: Local residents have signed petitions to submit to the Carbon County Commission at their regular meeting on Monday, August 18. The petitions request the formation of a planning and zoning commission to set up a citizen initiated zone. The zone would define highest and best management standards for drilling in the area. Updates to come on this blog. This entry was posted in Community Organization, Politics and History and tagged Bakken, Beartooth Mountains, Belfry, Bridger, Carbon County, Carbon County Research Council, ECA, ECA safety record, energy, Energy Corporation of America, ExxonMobil, Fracking, groundwater contamination, John Mork, Lawsuit, Montana Board of Oil and Gas, Montana Declaration of Rights, Northern Plains Resource Council, production foreman, Senator Tester, skiing, split estate, water, well permits, western meadowlark. Bookmark the permalink.